Yes, I am well aware it is now Thursday. I forgot to push the publish button yesterday evening. The Archer pattern was all ready to be cut out today, but in a last-minute change of heart I decided that I really need jeans much more than I need another button-up. The fact that I have ripped the knee of my only acceptable pair of jeans but am still wearing them to teach occasionally may have something to do with this shift in priorities. Anyway, buying pants is just the worst because they either cut off blood flow through my thighs, or they require a belt and a set of suspenders to not fall off my waist. Initially, I wanted to use a pattern I found in one of my Knipmode magazines, but I turned to the internet for advice first. I was pleasantly surprised that in the year that I almost abandoned the sewing corners of the internet a wonderful jeans had emerged. I took a long time to decide which size to cut, because as always my hips and waist are different sizes. It looked a lot more complicated to grade between sizes here than it is for skirts or dresses. Eventually I decided to cut a size 8 at the waist and grade to a 10 at the hips, with a little bit extra on the inner thighs to be sure. Hopefully I can get it basted together later this week, and see if the fit is alright. 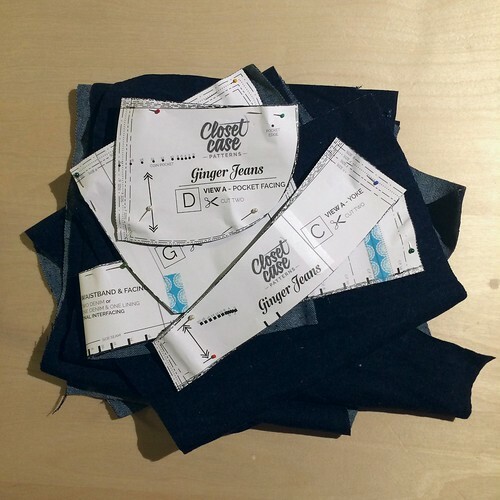 This will be my first time sewing jeans, and I’m kinda nervous about it. Not about the technical aspects, but about getting the fit just right, and whether my machine will be able to deal with all those layers of denim.